Have you tried the Onion Flu Trick? Chances are you are like everyone else right now and avoiding the flu like the plague. Or maybe you aren’t! I found out during the plague people used onions to ward off “noxious air”. The idea was the onion somehow absorbed the sickness. 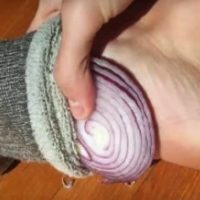 I guess people are willing to try just about anything to avoid the flu because, according to several posts on Facebook, there are many people who have decided to bring the old onion trick back. These are the moms among us who are willing to try ANYTHING! They are cutting onions and placing them in the slices in their socks overnight. Some claim they actually feel better in the morning! As far as I am concerned, I haven’t been sick yet so I can’t try to but I guess there is nothing to lose. I mean, other than dealing with onion feet.